​Greek banks have a green light to access an additional €10 billion in emergency funding from the central bank, according to a government official. Athens is apparently demonstrating its intent to roll back austerity measures. "Greece does not aim to blackmail anyone but will not be blackmailed either," the government official, cited by Reuters, said. Emergency Liquidity Assistance funds will be sourced from the Greek Central Bank. Previously it was capped at €15 billion, and this has been raised to €25 billion. The European Central Bank has stepped up pressure on Greece by suspending a waiver that had allowed it to swap its junk-rated debt for loans. This means Greece could run out of cash by the end of February. "The ECB's decision ... is an act of political pressure to quickly reach a deal,” the official said. Released late on Wednesday, the ECB statement says that the bank is no longer going to carry the risk of Greek bonds. The document was released after Greece’s new finance minister, Yanis Varoufakis, met with ECB President Mario Draghi. The new exclusion will come into force on February 11. After that, cash-strapped Greece will be without this crucial source of funding for its economy and could run out of cash by February 25. 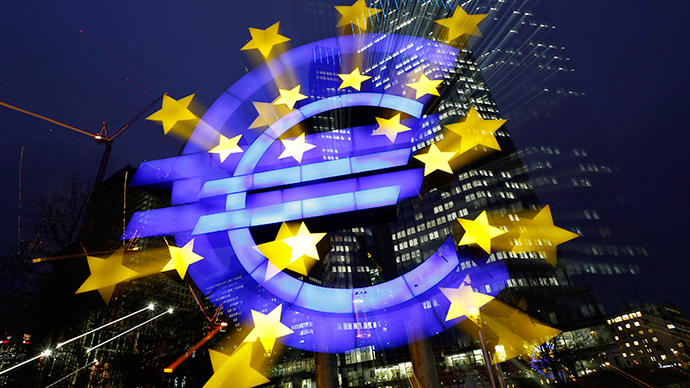 The euro fell 1.2 percent on the news, and the Greek stock market dropped more than nine percent in early trade. Greece will not be entirely cut off from ECB funding, the country can continue to borrow, but at a more expensive rate, 1.55 percent compared to the near-zero interest rate set by the bank. This loan is called Emergency Liquidity Assistance (ELA) and is still available. ELAs currently have a €15 billion limit on short-term borrowing. Athens tried to react calmly to the cut off. “The Greek banking system remains adequately capitalized and fully protected through access to the Emergency Liquidity Assistance,” the Greek Finance Ministry said in a statement. The new Syriza government has asked the ECB for to continue supply liquidity to Greece’s financial system on favorable terms until June 1. After the Syriza government swept into power after the January election, many speculated it was heading towards an exit from the eurozone, but so far anti-austerity ministers have taken the reigns, and insist Greece will meet its debt obligations. Finance Minister Yanis Varoufakis is schedule to meet his German counterpart Wolfgang Schaeuble Thursday. Pressure is now mounting on new Prime Minister Alexis Tsipras to accept the EU’s terms of Greek’s bailout program instead of present his own ideas, which included debt forgiveness from eurozone partners. Tsipras has been on a tour is Europe, meeting with the likes of European Council head Donald Tusk and EU Commission chief Jean-Claude Juncker.